Here we report a bacteria detection method based on a flow cytometric bead system and 16S rRNA-targeted oligonucleotide probes. Polymerase chain reaction (PCR) was first used to acquire bacterial DNA including bacteria-specific sequences. Half of the resulting target DNA was then captured by a capture probe immobilized on a magnetic microbead (MB) surface. The other half of the target DNA was hybridized with a fluorescence-labeled signal probe. In this manner, a sandwich DNA hybridization involving a MB-based capture probe, the target DNA, and a signal probe was realized. The MB carriers modified with reporter dye were analyzed one by one by flow cytometry through a capillary. 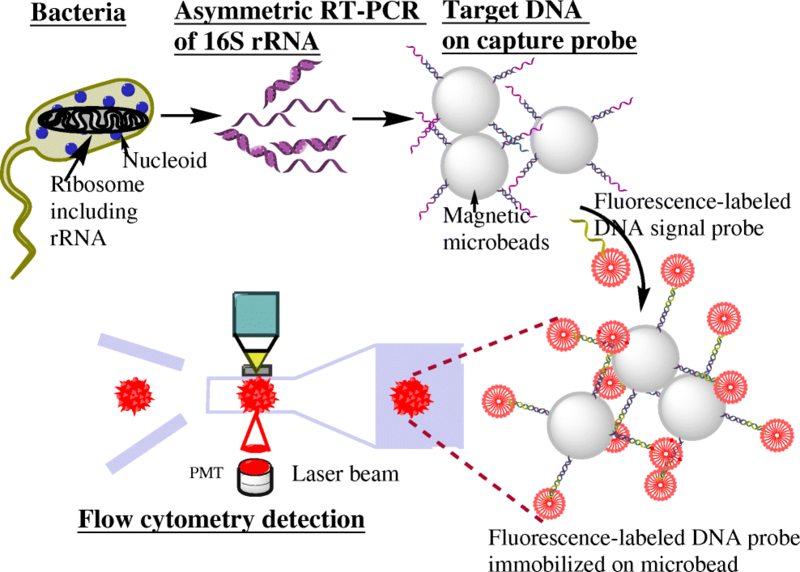 Using PCR amplicons and this flow cytometric bead system, a detection limit of 180 cfu mL−1 was achieved, along with high selectivity that permitted the discrimination of different targets when challenged with control bacteria targets and multiplexing capabilities that enabled the simultaneous detection of two kinds of bacteria. Given these advantages, the developed method can be used for the highly sensitive and specific PCR amplicon analysis of DNA extracted from a fresh bacterial culture, as well as multiplex target analysis. 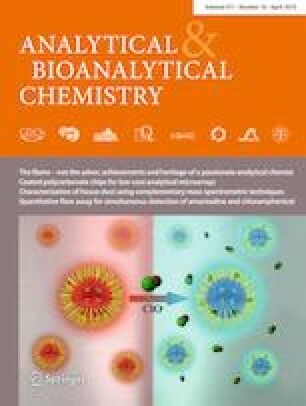 The flow cytometric bead system with 16S rRNA-targeted oligonucleotide probes for bacteria detection developed in this work. This system is highly specific and sensitive, with a detection limit of 180 cfu mL−1 bacteria. The online version of this article ( https://doi.org/10.1007/s00216-019-01651-2) contains supplementary material, which is available to authorized users. We gratefully acknowledge the support provided by the National Natural Science Foundation of China (41876101) and project funding from the China Postdoctoral Science Foundation (2016 M602199), the Young Elite Scientists Sponsorship Program by CAST (2018QNRC001), the Applied Basic Research Program of Nantong (GY12017005), and the AoShan Talent Program supported by the Qingdao National Laboratory for Marine Science and Technology.